The following chart illustrates population breakdown by race. 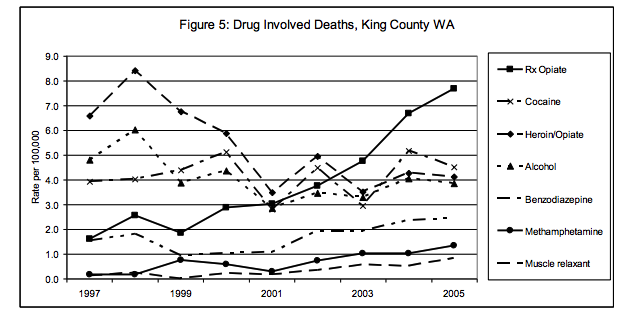 The chart below illustrates prescription opiate sales to hospitals and pharmacies in Washington state, specifically the change from 1997 to 2005. Hydrocodone is by far the highest dosed opiate sold in Wa as of 2005 data, followed by oxycodone, methadone, morphine, codeine, and finally hydromorphone. 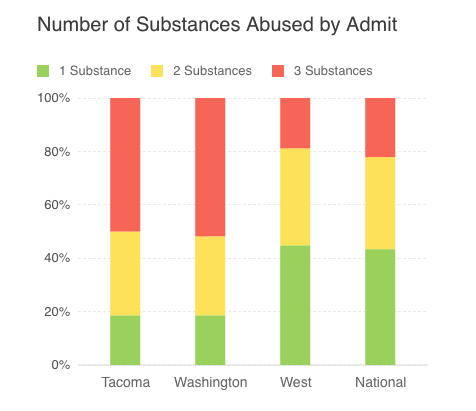 The chart below shows the number of substances abused per admit in Tacoma as compared to Washington State and National Average. 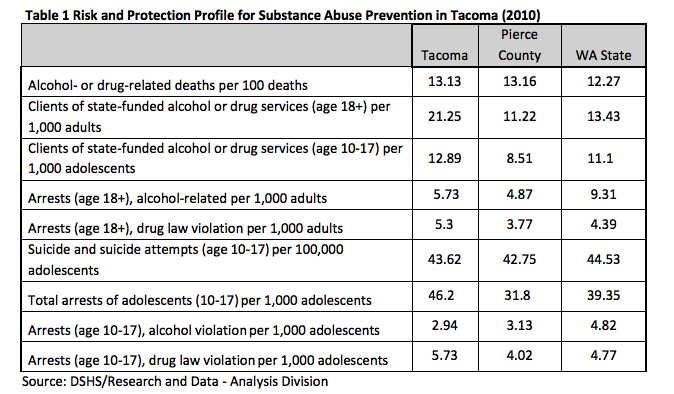 Tacoma has a far greater percentage of substance abuse-related admissions that combine 3 substances at once. Nearly 50% of admissions contain a patient with 3 substances in their system, this is close to the Wa average, however far greater than the approximate 20% national average. 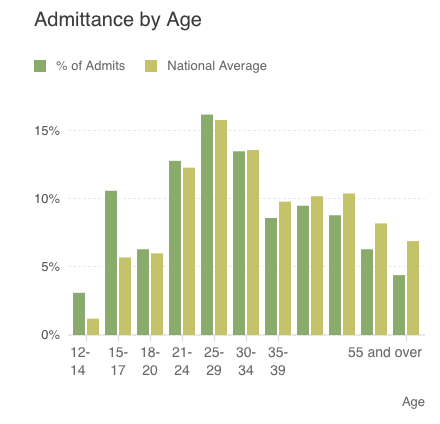 The following graph shows another alarming trend the number percentage of admits by age, as you can see the younger residents are being admitted at a far greater percentage than what is seen at a national level. Tacoma averages 13.13 Alcohol and Drug Related Deaths per 100 Deaths, in line with Pierce county, yet nearly a full point higher than Washington State as a whole. Clients in state-funded alcohol or drug services (ages 18+) are 21.25 per 1000 adults in Tacoma, compared to 11.22 in Pierce County and 13.43 in Washington State. Clients of state-funded alcohol or drug services (ages 10-17) per 1000 adolescents is 12.89 outpacing both Pierce county and the state. This is combined with higher arrests due to drug law violation than the county and state. Adolescents are paying the price in Tacoma with higher arrest rates as well.